A one-of-a-kind magic show flies into heart of the city this August, performed by two "charmingly deceitful gents" Scott Stunz and Jace Wonders. The two highly skilled entertainers will introduce you and your family to the world of illusion and magic in a 1920s style show; Auslusion. Mr Stunz and Mr Wonders will take you back to the 'Golden Years' in Speakeasy HQ's atmospheric little theatre on Flinders Street, renowned for cabaret, comedy and vaudeville acts. 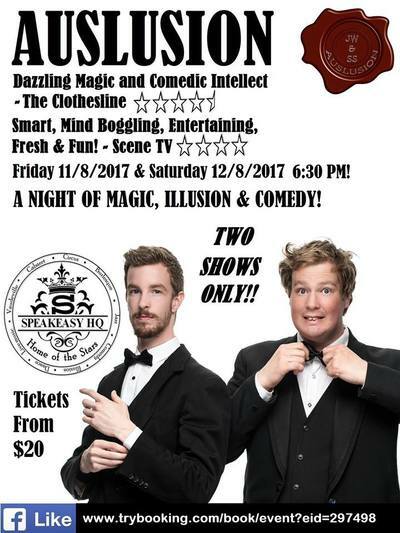 Both shows begin at 6:30pm where the two "gentlemen of magic" will take you on an intimate journey through comedic intellect, marvellous mind reading involving members of the audience, elegant sleight of hand and manipulation, escaping from a straight jacket and something with an egg whisk! "Confidence tricksters; the sort of people around whom you need to keep your eyes open ALL the time! There were good bouts of hearty laughter and appreciative applause in this hour of unrelenting sleight of hand, card tricks, and illusion. Auslusion damn fine for families! (4.5 Star Review)" - The Adelaide Show. Following sell-out shows and rave reviews from all over Australia, Auslusion performing at the Speakeasy HQ is clearly a show not to be missed. See Mr Stunz and Mr Wonders perform Auslusion on Friday 11 and Saturday 12 August, 2017. Costs: $20 for Little Wizards. Grown-ups $25. Book: Book your tickets HERE. The Auslusion duo would like to offer one KidTown Melbourne reader a family pass valued at $90 to see this magical show at the Speakeasy HQ in Melbourne on Friday 11 August, 2017 @ 6:30pm. To enter, email us at kidtownmelbourne@gmail.com with the word Auslusion as the title of your message, and tell us why you would like to win. Closing date is 5pm AEST Monday 31 July, 2017.